Outside the Google Science Fair, a middle school student bounced up and down, pointing excitedly at someone famous he just spotted. "This is Ahmed!" he shouted to his friends. 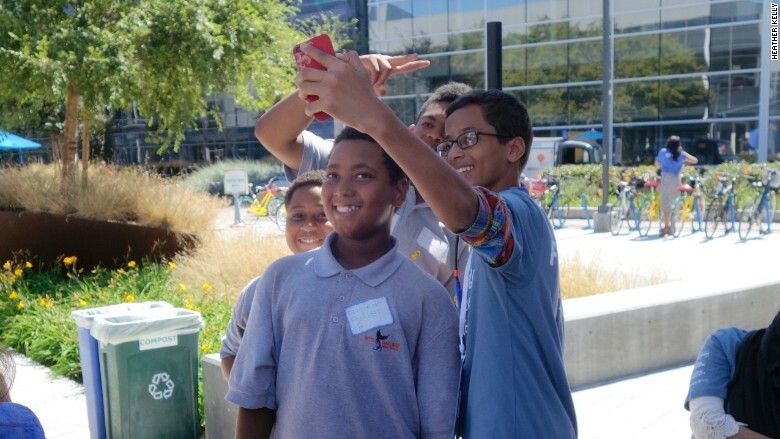 To the kids who gathered at Google on Monday, there is probably no bigger celebrity right now than Ahmed Mohamed. The 14-year-old from Irving, Texas, landed in the spotlight last week after he was detained by police for bringing a homemade clock to school. The trip to California to visit Google's (GOOG) Mountain View campus was his first since the incident made him the subject of international news coverage. He received a flood of invitations to visit major tech companies and even President Obama at the White House. The grand prize winner was Olivia Hallisey, a 17-year-old from Connecticut. She created a portable, inexpensive diagnostic test for Ebola that doesn't require refrigeration. Singapore's Zhilin Wang designed a type of zinc air batteries that could make renewable energy more accessible, and, in turn, give kids around the world light for reading at night. Anela Arifi and Ilda Ismaili devised a system to create and store alternative biofuel made from chicken feathers, something they hope could help their "small but beautiful" homeland of Bosnia and Herzegovina. "It's been a great honor to be able to meet other people who have as much interest in science as we do," said Arifi. 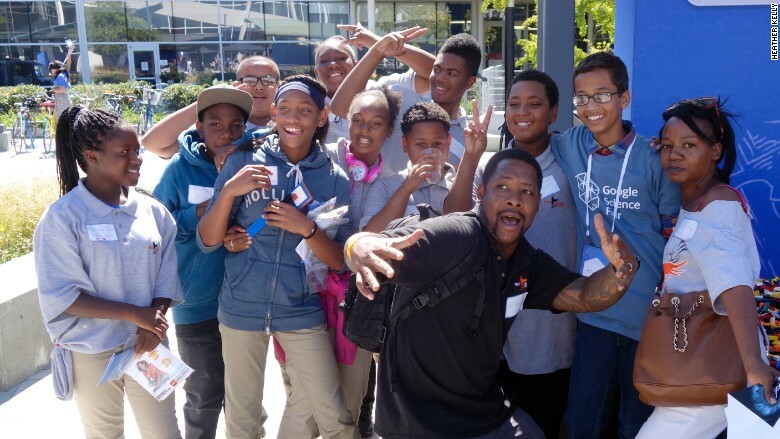 "The more they get to see scientists who are their age, who are personable ... the more they see themselves as presenters in two to three years," said Kennan Scott, a teacher at West Oakland Middle School. He brought his engineering students to the fair. This is the fifth year Google has hosted the fair. Hallisey gets a $50,000 scholarship from Google for the grand prize. National Geographic, Scientific American, Lego and Virgin Galactic are also awarding prizes. This year's fair, themed "It's your turn to change the world," started taking applications in February. Google received thousands of entries in 11 languages. It whittled them down to 90 regional picks, and then the final 20. Ahmed Mohamed poses for selfies with fans at the Google Science Fair. Finalists came from eleven countries -- as far away as Russia, India and Taiwan, and as close as Cupertino, California. "You go to my school!" one girl said to Anika Cheerla, a student at the nearby Monta Vista High School. The two quickly started talking about the best language for building neural networks. Cheerla spent the last year creating a diagnostic tool to help doctors more easily diagnose Alzheimer's disease. "I was a normal kid before I started this project," said Cheerla. "Now I've transformed into someone who does machine learning in my free time." Outside, a group of the West Oakland Middle School students posed with Google's special guest as their teacher yelled, "We stand with Ahmed!" Scott has talked about Mohamed's story in class as part of an ongoing conversation about discrimination. Mohamed, wearing an official Google Science Fair T-shirt that said "Finalist Fan" on the back, took an occasional break from the never-ending selfies. During a lull, he hopped on a Google bike and sped around the sprawling campus by himself, like a 14-year-old kid.